If the Stream+ does not have guide info for certain TV channels, you cannot record them. Some channels that are scanned are missing in the guide. There may be a fix, but why are they missing in the first place? It is impossible to start watching a recording in progress from the beginning - you must wait until the recording finishes. However, you can start watching a live show and pause it. There is no mute button on the remote. End of recorded shows are sometimes clipped, or only half of a movie is recorded due to inaccurate guide times. Some streaming services are not available - even some that are available on Android phones. There is no written manual - not even on the internet. Playout is limited to HDMI - cannot stream to a phone or other network device. Brief playout pauses when recording two shows - perhaps due to external hard drive not keeping up. Easy setup if you have an Android phone or tablet. Easily record any show displayed in the guide. Control the TV power and volume with the Stream+ remote. Includes Chromecast to play content from your phone or computer. Connect with built in Wi-Fi or wired network. Sometimes available as an open box item at a discount on Channel Master's Ebay store. Missing features may be added in the future. Do not purchase the Stream+ if you do not have internet. 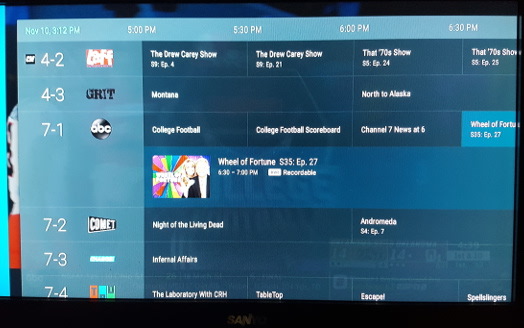 Unlike the older DVR+, it does not receive guide data over the air. Like most video devices, an HDMI cable must be purchased to connect it to your TV. To receive free over the air TV, you must connect it to an antenna. To use it as a DVR, you must connect it to an external hard drive (1 to 2 TB recommended). The DVR only records over the air broadcast channels. The Stream+ is powered by Android TV which includes many streaming services (apps). Some services not available include; Netflix, Amazon Prime, iTunes, Stirr, and many others. Oddly Amazon Prime is available on Android phones, but not on Android TV. However, here is a possible work-around. Stream+ has Chromecast built in, so you can find and play content on your phone, tablet, or computer and cast it to the Stream+ if you prefer watching on a bigger screen. The Chromecast app is available for Android and iOS (Apple) devices as well as the Chrome browser on any computer  Windows, Linux, Mac, and Chromebook. Some Chromecasts may not be the best quality. The Stream+ remote is pretty basic with a built in microphone and a mic button that functions the same as the mic icon for other Android devices. However, many apps are not voice enabled. Your Android phone or tablet can function as a remote with the added functionality of using your device's on-screen keyboard. The Stream+ contains two TV tuners, so it can record up to two local TV shows at once while also streaming or playing the DVR. Or watch live TV while recording another channel. It is possible to pause live TV. It is easy to select shows to record from the program guide up to two weeks in advance. You can choose to record a single show, all episodes of a show on this channel, or all episodes on any channel. Although the guide for local channels shows programming for only two weeks, it is aware of programming a month in advance. If you choose to record a series, and then look to see what is scheduled to record, you will see a month's worth of recordings. Up until mid December 2018, the schedule only showed two days ahead. Two weeks in advance is a big improvement. If you already have an Android device, setting up the Stream+ is very easy, but not quite as easy as just setting your phone on top of the device. Without an Android device, you have to enter your Google credentials using the remote to select letters from an on-screen keyboard. Once you get it set up, it is very easy to use. ABC, BBC America, Bloomberg TV, CBC News, CBS Sports, CNBC, CNN go, Disney Now, Dove Channel, ESPN, Food Network, Fox News, Fox Now, Fox Sports Go, FX Now, Google Play music & TV, HBO Go, HBO Now, HGTV, Hulu, Kids Click, MLB At Bat, NASA TV, NBA, NBC, NBC News, NFL, Nick for Android TV, Pandora, Spotify, iHeartRadio, and other audio, PBS Kids, PBS Video, Pluto, Philo, Pure Flix, Showtime, Sling TV, Snagfilms, Starz, TBN, The Weather Network, Travel Channel, Tubi, Up Faith and Family, Watch TBS, Watch TNT, You Tube, YouTube Kids for Android TV. Bold = completely free (usually contains commercials). You may already know that these streaming apps are not channels, but rather most have many (hundreds or perhaps thousands of) TV shows and movies. Some of them have live streams to watch like traditional TV channels, but most content is on demand so that you can watch complete shows when you are ready. YouTube is known for their free content, but they also have live channels including sports and a DVR function for a price. Many cable / dish channels are available cheaper from streaming services such as YouTube TV, Hulu, Sling TV, and others. Pluto and others have several free streaming live channels for the channel surfers. Unless there is some channel on your pay TV service that you cannot live without and is not available via streaming, you can probably save some money by cutting the cord as they say of people who cancel their traditional pay TV service. You may have seen the official Channel Master description of their Stream+. Charles Young has worked as a radio and TV broadcaster for many years, and is still learning about new things.